If you want to start seeing better results from your website, you need to know how to do SEO. But optimizing a site isn’t always a straightforward process. The exact strategy you use depends on your needs, goals, and business — meaning that a lot of planning and work goes into optimizing a site. But when the search engine optimization techniques are done correctly, the results are more than worth it. So if you’re ready to start attracting more traffic and generating more conversions, keep reading for 11 steps you can follow to reach your SEO goals. How Important Is SEO For Traffic and Conversions? Before learning how to do SEO for a website step by step, you need to understand the importance of SEO. As you’ve likely gathered, optimizing a site requires a lot of work. This may lead you to question whether it’s really necessary, and how important it is for traffic and conversions. After all, it’s not the only way to generate traffic to a site. So can’t you just channel your budget into easier, less work-intensive channels? That’s because today, 93% of online experiences begin with a search engine. This means that when your target audience goes online to find information about your industry, nine out of ten start by performing a search on a search engine like Google. If you want to bring those users to your site, you need to rank in the results they see. And unfortunately, it’s not good enough just to appear within the first few pages, either. Even within the first page, the position in which your site ranks can have a major impact on how much traffic your site earns. Just consider that the first result for any given search gets an average of 20.5% of the clicks on the page. That number decreases to 13.32% for the second result and 13.14% for the third. This means that the top three results alone earn almost half of the clicks on the results page. So if your site isn’t ranking near the top of the page for important searches related to your business, you’re missing out on qualified traffic. And more importantly, you’re missing out on leads. After all, the goal of SEO isn’t really to earn high rankings for your site. Ultimately, it’s about earning new leads and sales — but searchers can’t become customers unless they find your site, and that will only happen if you’re ranking well. It’s also important to note that an SEO strategy isn’t just a great source of leads in terms of quantity, but also in quality. In fact, leads from SEO have an average conversion rate of 14.6%. Compare this to traditional advertising’s average lead close rate of 1.7%, and it’s clear that you stand to gain a lot by optimizing your site. So while SEO can be a work-intensive process, the results your business will see in terms of leads and sales make it entirely worth it to invest in a well-planned strategy. If you’re new to SEO, optimizing a site can seem like a daunting task. And to be clear, there is a lot of work involved in an effective SEO strategy. But it doesn’t have to be guesswork. Use the following 11 steps to guide your optimization efforts, and you can be confident that you’re on the right track. The first step in any SEO strategy is a site analysis. This will serve as a baseline for your progress, and will also help you identify areas of your site that need particular attention. First, you’ll want to establish baseline rankings for your target keywords. See where you stand in the results pages for the words and phrases that are most important to your business. Then, take a look at your organic traffic numbers. While overall traffic numbers can also be helpful, focusing solely on organic will help you get a clearer picture of how your strategy is working. Next, spend some time looking at how your on-page elements, like title tags and headings, are optimized. If you’ve never done SEO, they may not be optimized at all — and that’s okay. But recording this information will help you measure how each change impacts your results. From there, you’ll want to review your off-page factors, with a focus on your site’s backlink profile. Knowing where your existing backlinks are coming from will help you assess your authority and possibly identify new link opportunities. Finally, see where your site stands in terms of both speed and mobile-friendliness. These metrics will give you a general idea of the user experience your site provides and will show any clear opportunities for improvement. After analyzing your own site, you’ll also want to perform competitor research to see where other businesses in your industry stand with their SEO strategies. 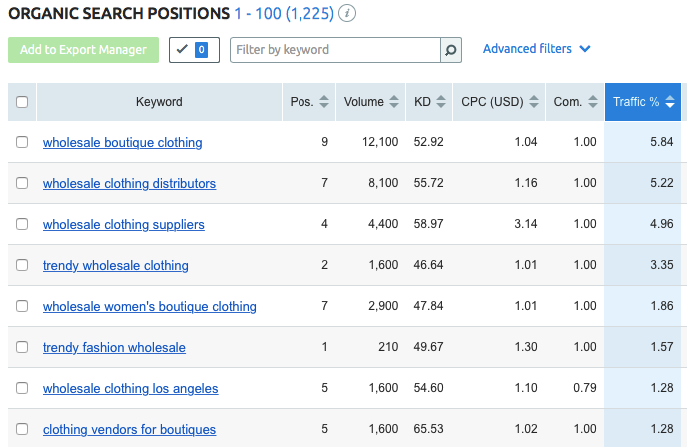 You can start by using SEMrush to uncover the keywords your competitors are currently ranking for. If you find any relevant keywords your business isn’t yet targeting, they could be excellent opportunities for your site. 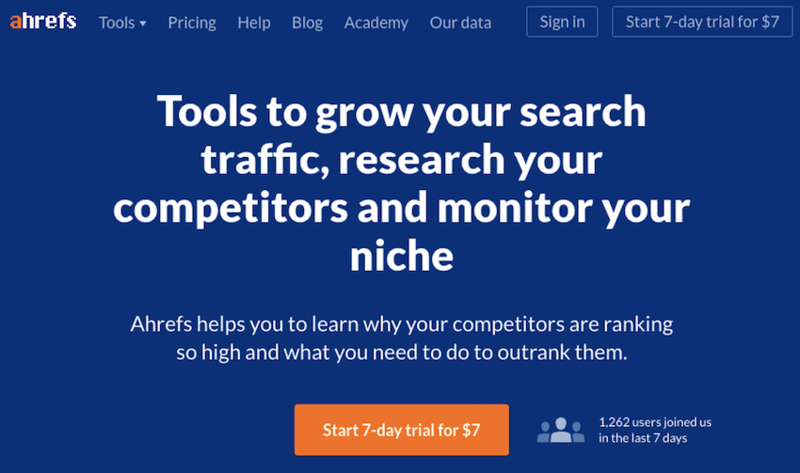 Then, use Ahrefs to scope out your competitors’ backlink profiles. The more you know about who’s linking to other sites in your industry, the easier it will be to find sites that will also be willing to link to you. Keyword research is an essential step in the SEO process. It involves uncovering your target audience’s search habits and can shape your on-page optimization and content moving forward. And while it can sometimes be a complex process, the basic idea is relatively straightforward. After all, you already have a general idea of which words and phrases your audience uses when searching for information about your products and services. And from there, you can use tools like Google’s suggested search feature to uncover the exact terms they use. 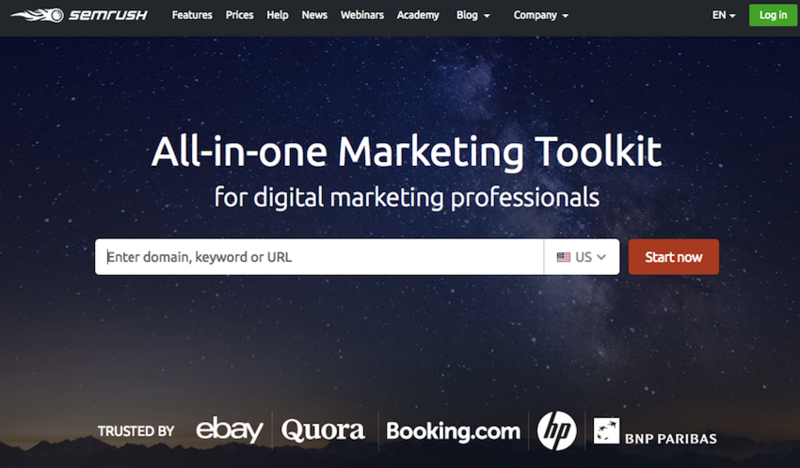 Then, you can use tools like Keywords Everywhere extension to evaluate those keywords and determine which present the best opportunities for your business. Of course, this is a simplified explanation of the process. But you can learn everything you need to know by reading our guide to keyword research. Before you dig into the nitty-gritty details of site optimization, you’ll first want to fix any major issues you uncovered during your site analysis. If you found any broken links, elements that don’t display correctly on mobile, or site speed issues, you should aim to correct these problems as quickly as possible. That’s because they can have a bigger impact on your rankings than you may think. Plus, user experience plays a major role in whether your visitors stick around long enough to become customers. In fact, one study showed a 25% decrease in conversion rates with just one extra second of load time. This means that if your site takes more than a few seconds to load, you could be missing out on a ton of conversions, regardless of how well it ranks in search results — so improving your site speed would be a high-impact change. Once you’ve fixed any major issues, it’s time to work on your site’s on-page elements. 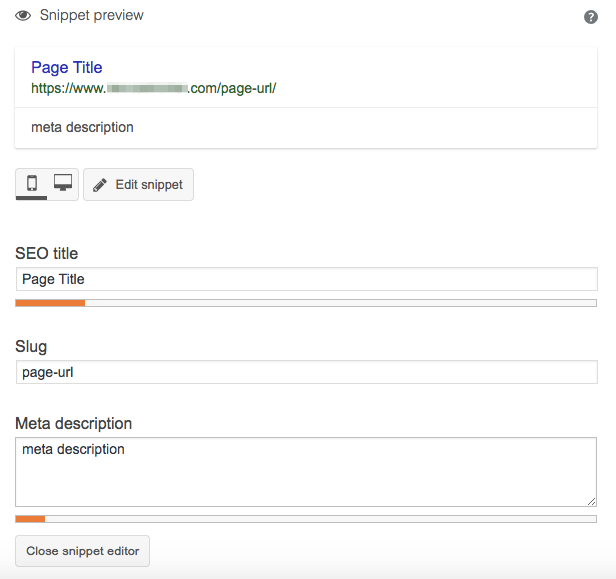 This includes all of the elements you have direct control over and can edit directly in your site’s HTML, like title tags, meta descriptions, and content. You can learn more about how to optimize these elements by reading our guide to on-page SEO. At this point, it’s important to note that the steps on this list aren’t exactly sequential. So as you optimize your site’s on-page elements, you should also be looking for opportunities to improve your off-page SEO, namely by building links. After all, pages with a high total number of links tend to rank highest in Google’s search results. So while on-page optimization is certainly an essential step, you shouldn’t ignore the link building process until you’re “finished” working on your site’s content. You can learn more about why these links matter, as well as the other factors that affect off-page SEO here. 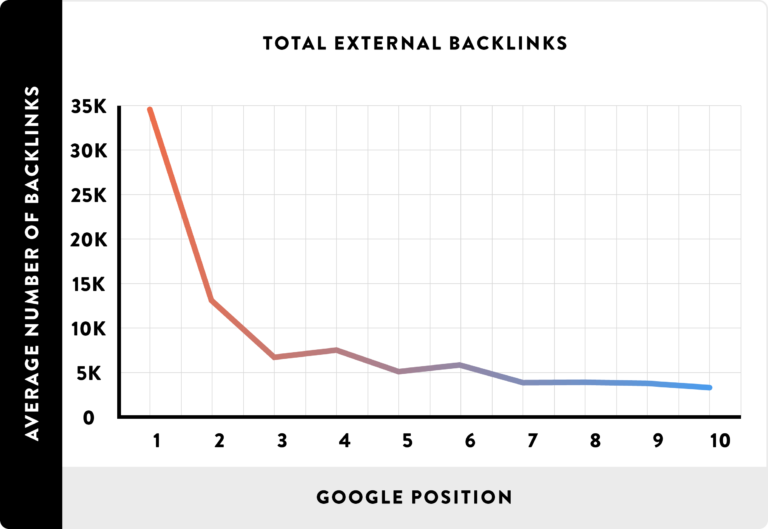 Then, learn how to earn links by reading our guide to earning quality backlinks for SEO. While site content is technically part of on-page SEO, creating it is important enough to warrant its own step in the process. As you uncover keywords, many of them may not be directly related to your site’s existing pages. This means that instead of simply adding them to title tags, you’ll need to create entirely new content around them. And while that involves significantly more work, each page you add presents a huge opportunity for traffic and conversions. 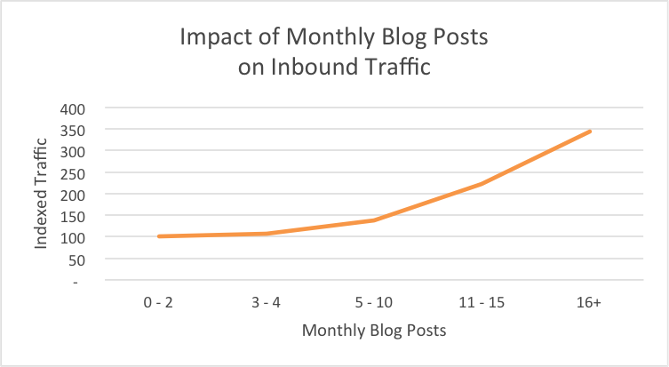 In fact, one study showed that companies that publish 16 or more blog posts per month attract almost 3.5 times more traffic than those that publish 0-4. So although creating new content for your site can be work-intensive, it could be exactly what you need to reach your SEO goals. If your business caters to customers within a specific location, or multiple locations, this should factor into your SEO strategy. After all, high traffic levels won’t do your business any good if all of your visitors are from outside of the area you serve. So to make sure that you’re focusing on searchers within your city or region, you can first include location-based keywords in your strategy. Beyond that, you should also register your site with Google My Business and complete your full profile. 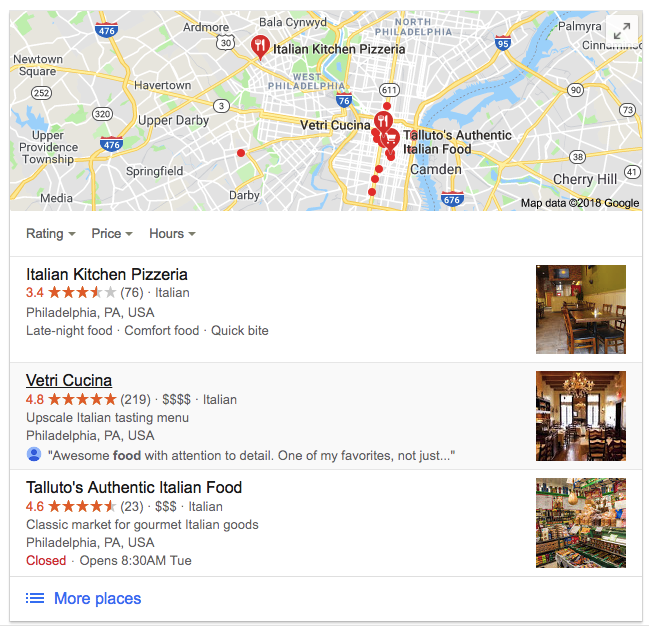 For many location-based searches, Google includes a map result, with details about businesses within the searcher’s target location. Registering with Google My Business is the best way to ensure that your business shows up for relevant searches. Plus, once you’ve verified ownership, you can add photos, hours of operation, and other details to improve the chances that searchers will choose your business. As you create new content, make sure to optimize it for your target keywords before uploading it to your site. If you’re creating content based on keywords you identify during the research phase, this process will likely come naturally for the body of your pages. But when it comes to elements like your title tags and meta descriptions, you’ll need to be a bit more intentional. Fortunately, if your site is run on WordPress, plugins like Yoast SEO make it easy to edit these elements. This step only takes a few extra seconds and can make all the difference in whether your new pages rank well in search results. Given that your goal is ultimately to translate traffic into conversions, it’s essential that your site provides a user-friendly experience. And the best way to do that is by monitoring how users interact with your pages and adjusting accordingly. With tools like Crazy Egg, this process is much easier than it might sound. 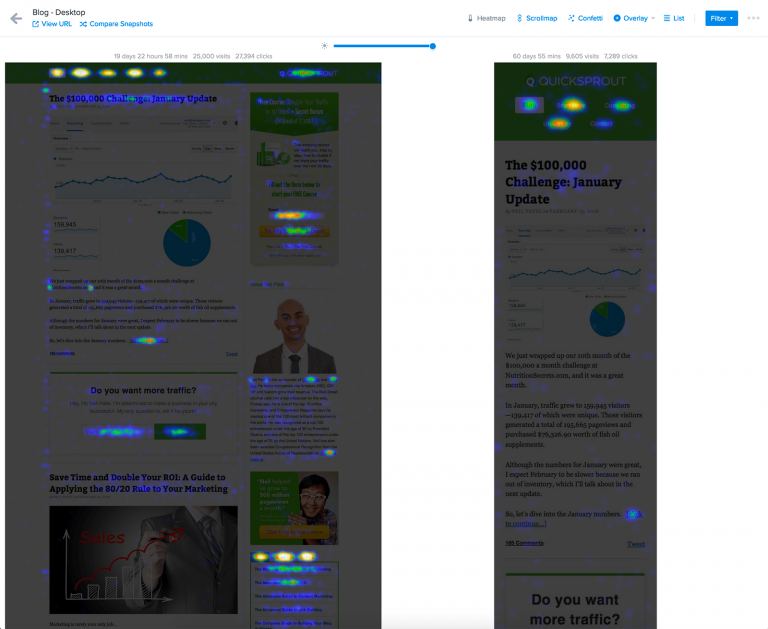 You can use tools like heat maps and scroll maps to see how your visitors engage with your content, where they’re getting stuck, and how interactions vary by referral source. If you notice any behavior that isn’t in line with your site’s goals, this is a clear indicator that you have some work to do to. Then, you can work towards creating a seamless experience for users — and convert even more of them into leads and customers. The most challenging step in any SEO strategy is arguably waiting for the results. After you spend time researching keywords, improving your site, and creating new content, it makes sense that you might expect to see your hard work pay off fairly quickly. But in reality, it can often take four to six months to start seeing impactful results from SEO. So after you’ve put in the initial work to optimize your site, remember to be patient. Continue to look for new opportunities, and be confident that as long as you’re following the steps above, the results will happen — they just might not appear quite as fast as you want them to. As you’ve likely gathered, creating and executing an effective SEO strategy can be a lot of work. But there are many tools available that can simplify almost every step of the process. 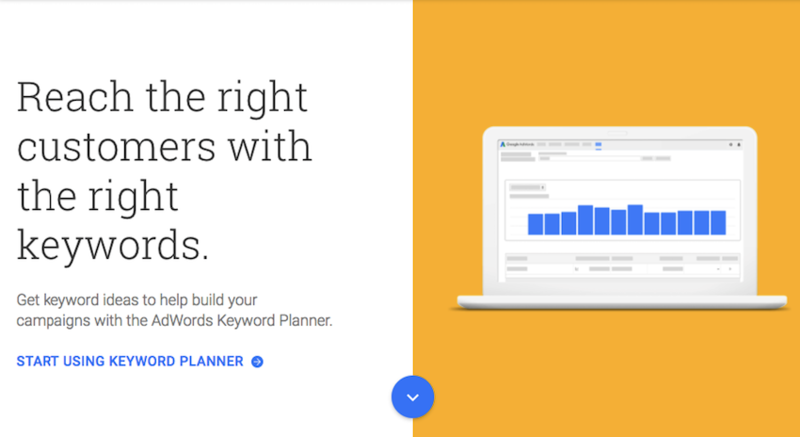 Keyword Planner is Google’s own keyword research tool. While it’s intended for helping AdWords advertisers create effective paid campaigns, the data it provides can also be helpful for SEO purposes. So if you’re already running ads on the platform, it can be an excellent source of data for your optimization efforts. 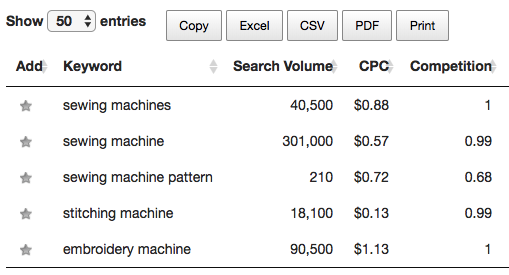 SEMrush is a competitor research tool, and one of the best available for keyword research. Simply enter a competitor’s domain, and you’ll have access to a full report with all of the keywords they’re ranking for, along with key metrics like search volume and competition level. You can learn more about these tools, as well as other valuable keyword research tools, by reading our guide on how to do keyword research. Ahrefs is best known as a backlink analysis tool, and it has many uses for both on- and off-page optimization. If you’re looking for new link opportunities, the data Ahrefs provides is hard to beat — and can help you determine the best places to focus your outreach efforts. 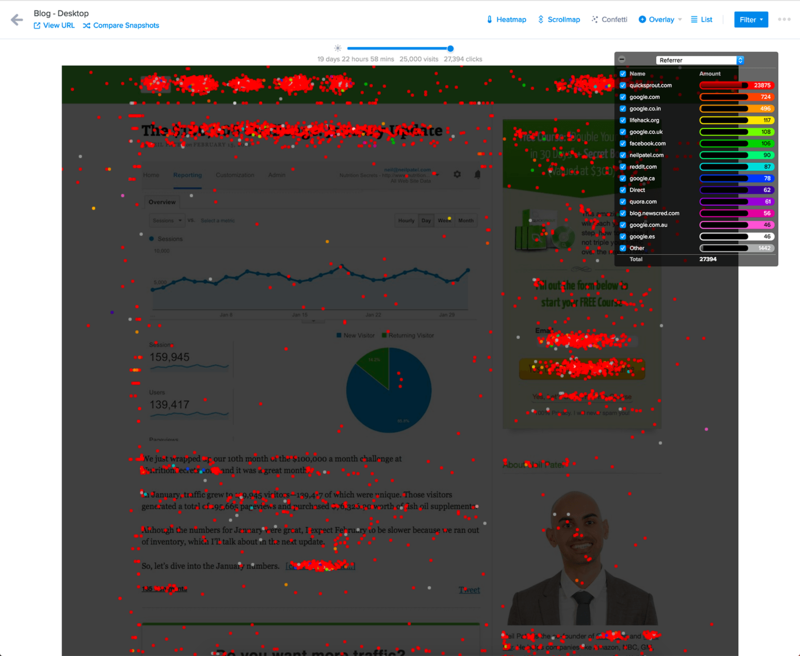 Crazy Egg’s heat maps, scroll maps, and other reports can help you better understand your visitors and how they interact with your content. While user experience is often overlooked in the SEO process, it’s an essential part of optimization. And if you’re not sure whether your site is providing the experience your visitors want, Crazy Egg can help you find out. Learn more about how to use these tools, as well as other available tools, by reading our guide to on–page SEO. You might be wondering whether the steps above really have the potential to improve your site’s traffic levels. The answer is yes — but you don’t have to take my word for it. There are plenty of case studies illustrating the impact of SEO. For example, just take a look at the following graph illustrating how one a brand new site grew its traffic from zero to 100,000 visitors in 12 months. 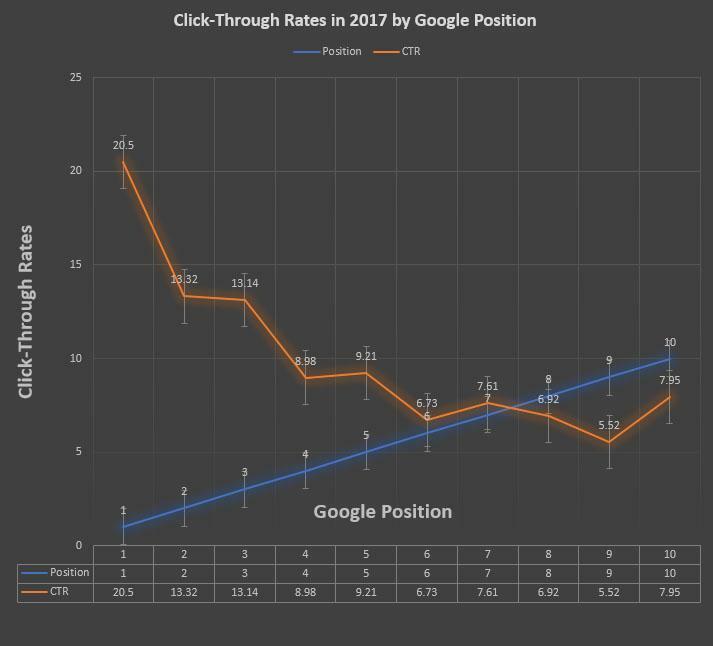 As Andrew Dennis, the marketer responsible for this strategy, explains, he was able to achieve these results by taking a slow, long-term approach to optimization. So if you’re hesitant about investing time and money into SEO, remember that this isn’t a passing trend or fad in the digital marketing world. It’s a proven way to increase traffic levels — and it’s also absolutely essential for achieving long-term results online. SEO can be a complicated process, so it’s no surprise that site owners often make mistakes. Here, we’ll cover five of the most common so that you can avoid them when optimizing your site. In the beginning, SEO was all about taking a single keyword or short keyword phrase with a high search volume and cramming that exact phrase into content as much as you possibly could. But that doesn’t work anymore. Over the years Google has updated its algorithm to deliver better results to its users. So while keywords are still important, it’s equally important to consider user intent. Give users what they want and need, and your SEO will improve — as well as your sales and conversions. In the early days of SEO, the goal was to obtain high rankings by any means necessary, and gaming search engines was part of the process. Today, this emphasis on rankings at all costs has been replaced with an interest in user engagement. After all, while rankings can be an indicator of how a strategy is performing, they won’t translate into results unless the pages they lead to are in line with what searchers want. So as you measure your results, remember that rankings only tell half the story — and that the other half lies within your conversion rates and other more important metrics. In terms of content, quantity used to be much more important than quality. The logic behind this was that if you had plenty of articles with the right keywords, people would come to your site and stick around. And a “good” article was between 250 and 500 words. As a result, a lot of the content online at this point was lightweight and low-value, precisely because of this formulaic approach. Content quality is now an important aspect of SEO. This means that each piece you add to your site needs to answer users’ questions with the necessary depth and breadth. Plus, when you provide value to your audience, you’re much more likely to win conversions. Early SEO also involved building as many links as possible, often through less-than-ethical methods. Article marketing, directory sites, article sites, link networks, and unacknowledged sponsored content were all standard practice — at least until Google started updating its algorithm to devalue these types of links. So again, quality now rules over quantity. A single link from a reputable site, that’s earned rather than bought, is much more valuable than a dozen spam links. Keep this in mind as you create your link building strategy, and you’ll be much more successful in achieving the authority — and rankings — you want. Early SEO didn’t place too much stock in user experience. Now, to be fair, many users were also less discerning about what they expected from a website. But improvements in technology and increased familiarity have changed that. Today, users won’t put up with websites that don’t work for them — so issues like slow load times and elements that are difficult to navigate on smartphones can make or break a site. In other words, good user experience equals good conversions. And poor user experience equals no conversions at all. While the most obvious goals of an SEO strategy might be increased rankings and traffic, it’s important that you don’t lose sight of the goals that have the biggest impact on your company’s success. In most cases, these goals relate to leads and sales. So as you optimize your site, remember to do so in a way that will generate leads for your business. This requires selecting keywords and creating content for all stages of the conversion funnel. But, of course, this is a simplified explanation of the process. And if you’d like to learn more, we’ve got you covered. Check out our guide to organic leads to learn more about SEO plays a role in lead generation, or our guide to SEO and CRO for more information about how to use these two strategies together for the best possible results. Figuring out how to do SEO in 2018 isn’t a straightforward process, and it certainly isn’t an easy one. First, you’ll need to start with a complete website analysis and competitive analysis. Then, you can do keyword research and work on optimizing your site’s on-page elements. From there, you’ll need to consider off-page factors, and work towards earning high-quality links from reputable websites. Even after you’ve completed these steps, though, your work won’t be finished. Search engine optimization is ultimately an ongoing process, and not a list of boxes to check — meaning that you’ll never really be done. When it comes down to it, there will always been room for improvement on your site. But by following the steps on this page, you’ll be well on your way to creating a strategy that will improve your online visibility, attract more traffic, and convert that traffic into qualified leads. How do you decide where to focus your efforts when doing SEO for your site?